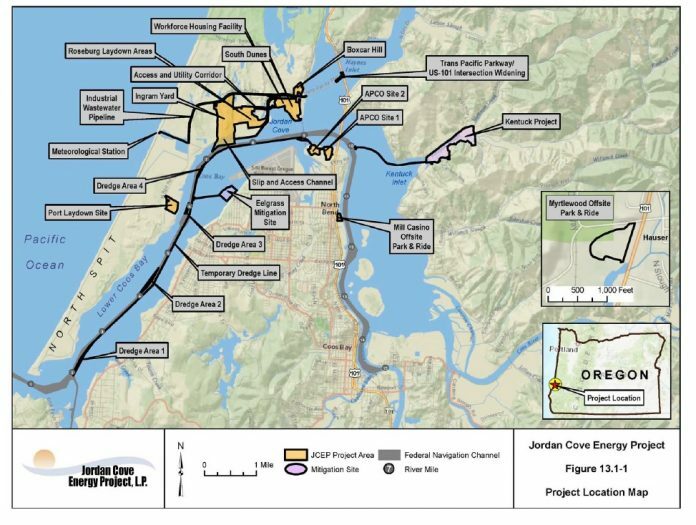 Jordan Cove Energy Project LP (Jordan Cove) has filed an application with the US Energy Regulatory Commission (FERC) seeking authorization to site, construct, and operate a natural gas liquefaction and liquefied natural gas (LNG) export facility (LNG Terminal) on the bay side of the North Spit of Coos Bay in unincorporated Coos County, Oregon, USA. The LNG terminal will be capable of receiving up to 1,200,000 dekatherms per day of natural gas via the Pacific Connector Gas Pipeline, liquefying it, storing it in two cryogenic storage tanks, and loading the LNG onto ocean going vessels for export. According to Jordan Cove, the LNG terminal will be designed to receive a maximum of 1171 MMscfd (33 x 106 m3/d) of natural gas and produce a maximum of 8.5 million tons (7.8 million tonnes) per year of LNG for export. The LNG terminal would be capable of receiving natural gas from the Pacific Connector Gas Pipeline, processing the gas, liquefying the gas into LNG, storing the LNG, and loading the LNG onto ocean-going carriers. The LNG Terminal consists of the gas conditioning unit, natural gas liquefaction unit, and LNG storage and loading unit. The gas conditioning unit is to be provided in one train. The gas conditioning unit will include a sulfur-impregnated activated carbon unit for mercury removal, a closed-loop amine solvent-based acid gas removal unit (AGRU) for carbon dioxide removal and molecular sieve beds for water removal (dehydration). Heavy hydrocarbons will be removed from the feed gas before the final liquefaction step to meet the LNG specification and prevent possible freezing at subcooled temperatures. The natural gas liquefaction unit will be composed of five parallel LNG trains. LNG produced from the liquefaction trains will be let down to near atmospheric pressure and stored in two LNG storage tanks. The flash vapor, combined with vapors from tank displacement and heat leak, flows to the boil-off gas (BOG) compressors for use in the fuel gas system. The LNG storage tanks will be equipped with three in-tank pumps for each tank for pumping LNG to the marine berth and into LNG carriers. An LNG recirculation line will continuously maintain the LNG loading piping system at operating temperature and ready for loading operations. The LNG terminal includes five liquefaction trains. Each train has a single two-stage, centrifugal refrigerant compressor driven by aero-derivative combustion gas turbine drivers with exhaust gas waste heat recovery.